In 2006, I was introduced to an accomplished business man and extraordinary gentleman, Jim Connelly. 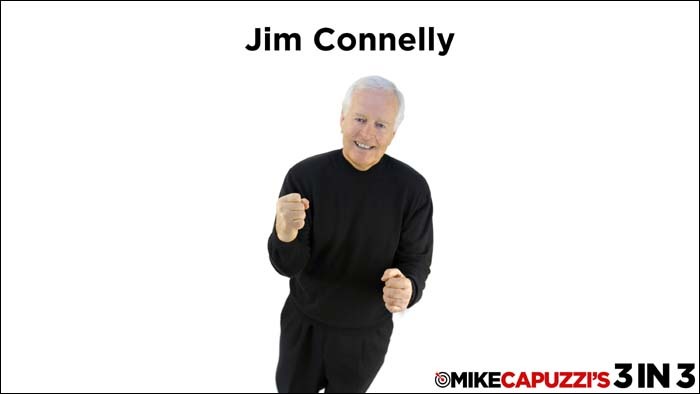 Jim is a businessman with a distinctive business background and his Rolodex of who he calls friends and colleagues is a “Who’s Who” of noteworthy individuals including Frank Sinatra, Lou Holtz, Jack Welch, and Regis Philbin. 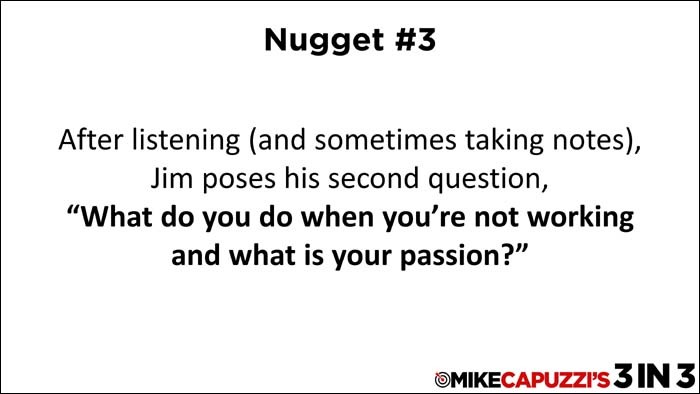 On this episode of 3 in 3, I’m sharing three nuggets of wisdom from Jim that had a big impact on me and I know you will benefit from too, so get ready for 3 in 3. 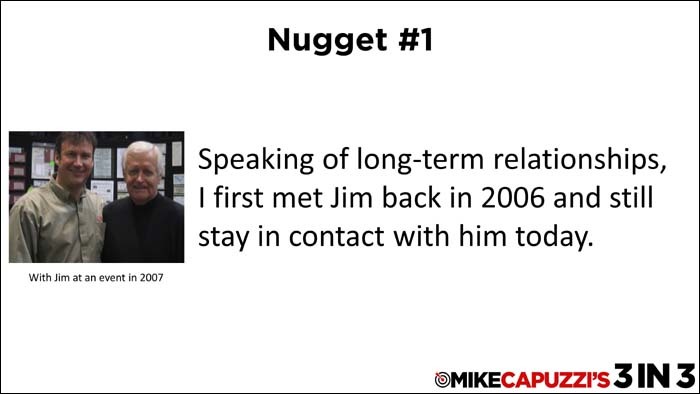 During his extraordinary career, Jim learned that the secret to any highly successful person is dependent on their ability to develop long term relationships. Early on he developed a simple, but highly effective system for creating meaningful and long-term relationships, including a two-question system I’m about to share. Speaking of long-term relationships, I first met Jim back in 2006 and still stay in contact with him today, 13 years later. This is why people like Frank Sinatra trusted Jim and considered him an important friend (make sure you check out the interview I did with Jim where he discusses how he helped Sinatra for an important project). 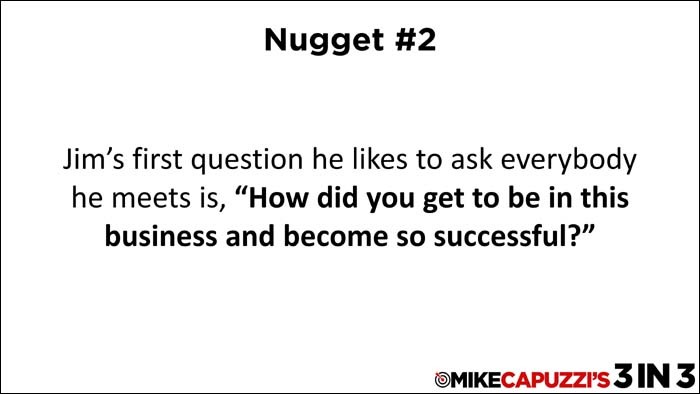 Introducing the Two Questions That Can Dramatically Improve Your Relationships! He then listens intently and allows the person to tell his or her story. His goal is to listen and get to know the person by allowing them to share. This strategy of listen first is effective and important when you meet somebody you would like to get to know better. He then uses the answer to this question to help him creating a meaningful relationship, including surprising the person with insightful gifts and items related to their answer to the second question. Jim’s strategies and techniques are simple, yet profoundly effective and important and worthy of using and sharing with your friends and colleagues. You can learn more about Jim at his web site, www.Jim-Connelly.com. So that wraps up this episode of 3 in 3. I hope you found Jim’s insights helpful and don’t forget to get the interview I did with Jim by clicking here.